Canary Home Security Review 2019 — Is a Subscription Worth it? Much like the coal miners of yesteryear, you can rely on a Canary to alert you to air quality dangers—as long as you have an Ethernet connection. Canary Home Security Review including pros/cons, pricing and comparison table, user reviews, and features overview. We’re singing the praises of this security camera like a (wait for it) . . . canary. 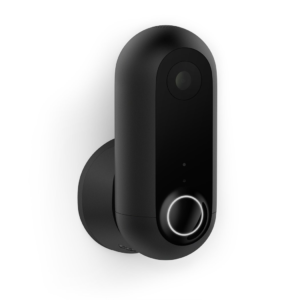 Canary’s main camera, the Canary All-in-One Home Security Device features a high-quality 1080p camera, two-way talk with truly clear audio, and mobile alerts sent directly to your phone. Combine that with an air-quality sensor, temperature and humidity sensors, and you have a more-than-average security camera. Keep an eye on pets or kids at home, watch for package deliveries, and monitor your climate. Canary also acts as a two-way audio speaker with loud (but pleasant) chirps for call-and-response or walkie-talkie-type interactions. You can use this to check in with the kids, or say hi to your dog friends from your mobile device. The Canary’s specs read pretty standard, but the high quality is hard to appreciate without using it yourself. In particular, the 147° wide-angle lens has a bigger field of view (FOV) than others—for instance, Nest Cam has a 130° FOV. Also, Canary’s 3x digital zoom can help you recognize smaller details in the picture. The camera’s picture clarity and wide-angle lens make it ideal for sticking in your living room to monitor everyone entering the home, for keeping an eye on your kids and pets, or for seeing who’s been taking all the cookies from the cookie jar. Canary’s biggest selling point is its air quality sensor, which makes it stand out from other security cameras. Allergy sufferers or those with breathing issues may benefit from keeping an eye on the health of your entire home. Canary is not a substitute for dedicated smoke or carbon monoxide detectors. What does Canary’s air quality sensor detect? Some users have questioned the usefulness of knowing that your air quality is abnormal, but for us it’s pretty evident: you want “normal” air readings. If your Canary is giving you an abnormal reading, it’s for a good reason—you may need an air purifier or humidifier, you may live in a city that needs to improve its air quality and reduce pollutants, or you may need to reset your Canary for a proper “normal” reading. This isn’t common, but also not unheard of. The voice quality of the Canary was really clear—better than some cellphones we’ve had in the past, for sure. The birdlike chime is actually pleasant compared to most alarms we’re used to. This clarity comes in handy on a day-to-day basis, but we could imagine using it to help identify intruders or clarify which of your children actually broke Aunt Thelma’s prized vase. Canary recommends an upload speed of at least 1 Mbps—meaning dial-up or non-internet users can’t benefit from Canary’s features, unfortunately. Dial-up or non-internet users can’t benefit from Canary’s features, but chances are that those seeking its hi-tech features are already connected, but if not, check out our Best Internet Providers article. We only had one major complaint about Canary, and it’s that the stream isn’t as reliable on a Wi-Fi connection as it is with Ethernet, which isn’t unexpected. We always recommend Ethernet over Wi-Fi when available and convenient. Our specific problem involved the livestream function: we were running some errands and checked on Canary’s livestream between tasks, but we were able to pull up only a frozen buffer screen. The remedy for us was simple enough: do a power cycle reset, or in other words, unplug it and plug it back in. While this is an easy fix, if you see that endless buffer while you’re away on vacation, you can’t exactly reach the power cord from there. This is less of a hard-fact negative and more of an inconvenience. Since Canary footage isn’t directly stored on your device or phone (which may or may not be preferable), you can download the clips you want to keep via request only. You can’t download from the app if there’s no internet connection, so it’s not technically an “immediate” download since the video is provided by Canary rather than being hosted the same way a file on a personal cloud would. Some of our videos were quick, but the others didn’t pop up til we checked later in the day. Canary’s All-in-One device is one of the fuller-featured cameras we’ve seen. Automatic location detection sets up your camera to alert you properly when you’re away or asleep at night, or it can ignore the movement of the room when your home during the day. We like not having to think about turning the camera on and off, but rather trusting the system to monitor when it needs to and quit bugging us when nothing’s happening. Canary recognizes the differences between people and objects, which is one of the more helpful features of any security camera. Trust us—you won’t care every time a bug flies across the room, but if you get only a few person alerts a day, it’s easier to stay on top of any security issues. Aside from immediate safety and security, the most useful aspect of having environmental detectors is the history snapshot that gives you an idea of your home’s changing (or unwavering) climate. 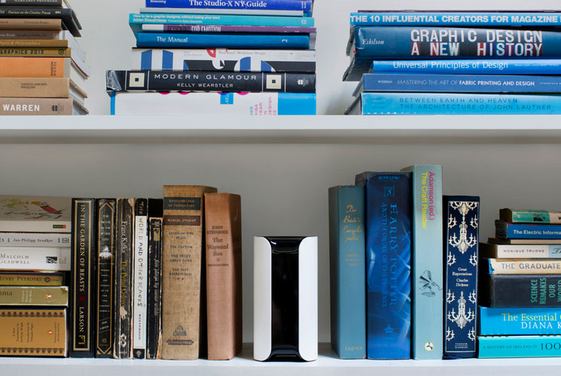 Like most smart home security cameras, Canary integrates just fine with all the big names. We like the idea of linking your Canary camera to your smart lights so if it detects movement, it can turn on the lights for you. You can also signal your Canary’s alarm to go off if it detects a sharp rise in toxicants in the air, or you could flash LIFX lights in a red strobe to visually alert the household. How much does a Canary camera cost? 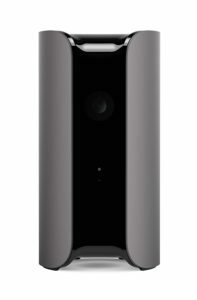 Not the cheapest security camera we’ve come across, but one of the fullest-featured. 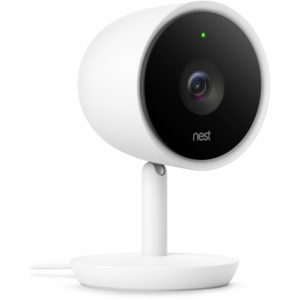 Canary isn’t exactly cheap at around $155 (at the time of this writing), but the beloved Nest Cam IQ is twice as expensive. The Canary Flex is about the same price, but in our opinion, it’s better for outside use, while the All-in-One unit is better for indoor use. We recommend subscribing to the Canary membership services for $9.99 per month (or save money by buying a year for $99). By subscribing, you get unlimited video downloads, two-way talk, desktop streaming, and 30 days of full-length video history. *Price at the time of this writing. Canary’s All-in-One unit might be your best bet, but have you considered these other two options? Canary View is a stripped-down and less-expensive version of the All-in-One with three major differences: 1) Canary View is WiFi only, which is slightly concerning since we ran into problems when we weren’t using Ethernet. 2) Canary View doesn’t have HomeHealth sensors, which you may not find necessary, anyway. And 3) Canary View doesn’t include a loud siren, but you’ll still get mobile alerts. Canary View is a great camera-only option, but loses what makes Canary special. Canary Flex is pretty similar to the All-in-One device, but with a few notable differences. Flex can be used inside and outside, instead of just inside. You can plug it in or use it wire-free, it has an extended-life rechargeable battery, and it has options for both upright and wall-mounted use. WIth the All-in-One unit, you get the environmental sensors (HomeHealth technology) and the built-in siren. Canary Flex is better suited for outdoor use and camera-only use. We really like the versatility of Canary Flex, and it’s only about $50 more at the time of publication, but if you need an indoor camera, HomeHealth technology, and siren, you should stick to the original Canary All-in-One. Nest has made a name for itself, and the Nest Cam Indoor IQ just strengthens that reputation. We love the Nest’s high resolution even when zooming (due to a 4K sensor and a 1080p resolution), along with its motion tracking. However, at 2.5 times the price (at the time of this writing), we have a hard time justifying the extra price for people who just need a security cam that works and not the coolest new thing. Nest Cam Indoor IQ is geared better for outdoor use and higher video and audio quality. We liked the Canary All-in-One’s approach to the security camera world, but we’re curious about your experience with Canary. Do you get too many notifications? Do you feel better about your home’s air quality? We want to know, so leave us a comment!